The National Park Service said Wednesday that it will end its relationship with the nonprofit that has run Claude Moore Colonial Farm since 1981. Residents are concerned about the prospect that it may close, and what would happen to the land if it did. See pictures of the farm, which re-creates life in 1771, and find out what's causing the disagreement. CORRECTION: The initial version of this report incorrectly characterized the future of the colonial farm attraction. 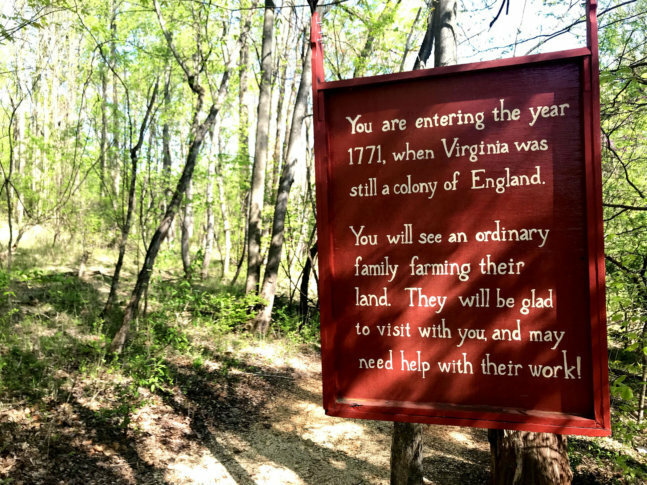 McLEAN, Va. — The National Park Service said Wednesday that it will end its relationship with the nonprofit that has run Claude Moore Colonial Farm since 1981. The popular tourist attraction, which sits on land owned by the park service, realistically depicts life on a 1771 farm. It was a landfill when the nonprofit group the Friends of Claude Moore Colonial Farm signed an agreement with the park service to operate the farm. After six years of negotiations and short-term extensions of that deal, the group has been unable to reach a long-term extension agreement with the park service. “The organization declined to sign a new long-term agreement and will, therefore, discontinue operations on Dec. 21, 2018,” said Jenny Anzelmo-Sarles, a spokeswoman for the National Park Service. Jeff Anderson, a member of the board of directors for The Friends of Claude Moore Colonial Farm, said the attraction offers a realistic look at the life of a tenant farmer just before the American Revolution. “Welcome to 1771,” reads the sign which swings over the gravel path that leads visitors from the farm’s gift shop toward the working farm. Rye, which resembles grass, stretches across the field, as a farmhand handles turkeys, which search for pests — just like they did 247 years ago. Each year, visitors to the colonial farm saw for themselves how dependent farmers were on the weather. “They get to see when things are going well, and when things are going badly. It’s that sort of experience that helps you see what history was really like. It’s not all Williamsburg and Philadelphia,” Anderson said. Now, Anderson said, the park service is requiring onerous, administrative-based changes that would make it impossible to operate the farm — maintaining animals, buildings, crops and employees — on its yearly budget of $400,000. “We don’t see why an operation that costs them nothing, that’s being run by a nonprofit, needs the oversight and burdensome bureaucracy that they’re trying to put onto it,” said Anderson. Anzelmo-Sarles said the park service negotiated in good faith with the farm. Anderson estimated it would take two employees to accomplish the administrative tasks the park service was requiring in its agreement. Still, Anderson hopes the parties can negotiate through the impasse. People in the community are worried about the prospect of the park closing permanently, and what would happen to the land if it did. “Rest assured that we have absolutely no intention to sell or commercially develop the park land,” said George Washington Memorial Parkway Superintendent Alexcy Romero in letters to those who have inquired about the future of the farm.